Allan Pinkerton, born in Glasgow, on August 25, 1819, founded the Pinkerton National Detective Agency. But his career as a detective began by chance. After emigrating to the United States in 1842, he established a barrel-making shop in a small town outside of Chicago. Pinkerton was an abolitionist (activist against slavery). His shop functioned as a "station" for escaped slaves travelling the Underground Railroad to freedom in the North. One day while out gathering wood, Pinkerton discovered a gang of counterfeiters making coins in the area. Assisting in the arrest of these men and another gang led first to Pinkerton's appointment as deputy sheriff of Kane County and, later, as Chicago's first full-time detective. In 1850, Pinkerton left this post to start his own detective agency. One of the first of its kind, the Pinkerton National Detective Agency provided a wide array of private detective services and specialized in the capture of train robbers and counterfeiters. By the 1870s, the agency had the world's largest collection of mug shots and a criminal database. The agency's logo, the All-Seeing Eye, inspired the term "Private Eye." 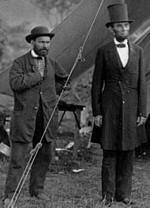 In 1861, while investigating a railway case, Pinkerton uncovered an assassination plot against Abraham Lincoln. The conspirators intended to kill Lincoln in Baltimore during a stop on his way to his inauguration. Pinkerton warned Lincoln of the threat, and the president-elect's itinerary was changed so that he passed through the city secretly at night. Lincoln later hired Pinkerton to organize a "secret service" to obtain military information in the Southern states during the Civil War. In Tennessee, Georgia and Mississippi, he performed his own investigative work and travelled under the pseudonym (false name) "Major E.J. Allen." After the war, in 1865, Pinkerton resumed management of his detective agency. By this time, the U.S. Secret Service had been established to fight counterfeiting. By 1901, its mission included protecting the president. In the late 1800s, Pinkerton guards and agents played an unpopular role as strike breakers. The agency had a harsh policy toward labour unions. Pinkerton said that he was helping the men by opposing unions. Union activists couldn't disagree more. Confrontations resulted and sometimes became violent. The Secret Service still plays an important role in Washington, D.C., as do detective agencies. Allan Pinkerton died on July 1, 1884.